Every family, especially here in Winnipeg – a diverse multicultural city, seems to have a different way of creating their family’s favourite cabbage roll recipe, especially for the holidays. The secret of ours is the Sour Cabbage. OK, well it’s not really ‘so’ secret. I grew up in Regina, and just outside the city is the beautiful Lumsden Valley full of great market gardens. Kissel’s Cabbage is based there, and they are known for their sour cabbage product. They supply the majority of that bagged greeny-grey cabbage (and sauerkraut) that you see in the produce section of grocery stores across Western Canada. I see that they even ship to Minnesota. So for my niece’s who always wanted to know how to make Grandma’s Cabbage Rolls, here’s the recipe… it’s super easy and fast. You don’t have to wait until Christmas to make them, as they are great on any cold, winter day! This is really a very simple recipe, and it’s a million times better if you make them fresh and eat the whole batch. I’m not a fan of freezing these, but my Mom used to always make an extra big pot full of them and place the pot and everything into the freezer. She’d pull them out when my Dad’s friend Vic came to town unexpectedly, as these were his favourite. 1. Mix all the ingredients together, except the cabbage. 2. Core the sour cabbage, and carefully remove the individual leaves. Remember the outside leaves make the bigger cabbage rolls – those are my favourite. but closer to the end of the leaf with the thick vein. There is a tricky balance between creating a nice, full cabbage roll and overfilling the leaf, so be generous with caution. 4. Fold the edge with the thick vein over the filling and roll once. 5. Fold in each of the side of the cabbage leaf and continue to roll the filling up tightly. Sometimes you may need to poke the corners of the roll into the filling. facing down, this will help to ‘seal’ the seam. layering them to the top edge of the pot. they are all covered with liquid. 9. Place the pot on your stove, and bring the water to a boil on High. for an hour or more on a Medium-Low setting. 11. Remove rolls carefully with a slotted spoon and serve. This is how I “roll”, I don’t really eat the cabbage leaves, but I like the flavour that they impart. My mama never said that I “had to” eat the cabbage. Usually I’ll eat a leaf or two, but I really just like the filling with a nice, soft white dinner bun. TIP: The smaller clumps of leftover cabbage leaves that are hard to roll can be shredded for sauerkraut and used on Reuben Sandwiches or over Bratwurst. Can you make this in the oven – Yes! Can you make it in a crock pot – Sure! My Mom actually used to make these in a Pressure Cooker. But if you make it this way on the stove-top, you will have homemade cabbage rolls in about 90 minutes. If you make them in the morning, you can have them for lunch, and probably dinner too! The other cooking methods are fine, they just take longer, and I’m impatient. 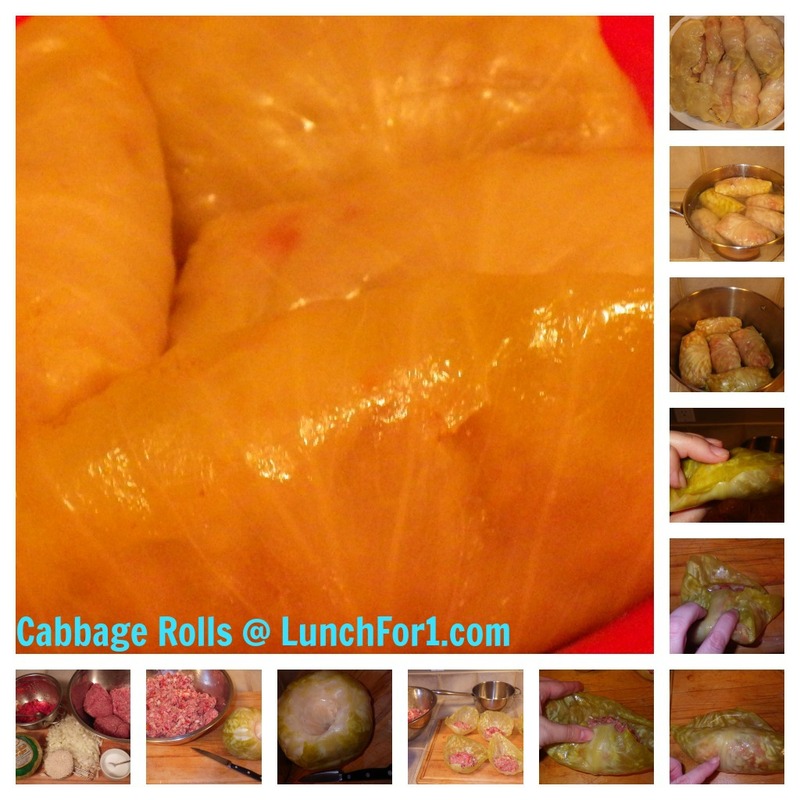 How do you make your cabbage rolls? Do you only make them at Christmas too?